The Compliant Deburring Blade (CDB), patent pending, is ATI’s most versatile deburring tool, featuring a durable interface to accommodate a variety of readily available hand-held blades and media. The pneumatically-controlled, articulated design gives users the ability to tune the contact force to accommodate specific applications by changing the air pressure. This deburring tool excels in light and medium deburring, chamfering, and scraping operations on materials such as plastic, aluminum, steel, and brass. 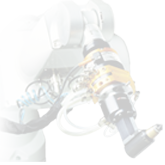 The CDB’s axial and radial compliance is ideal for reducing robotic programming time and maintain constant force where surface irregularities are present. The pneumatically-actuated compliance mechanism enables dynamic control of contact force to accommodate specific applications. Accepts standard off-the-shelf hand deburring blades and media that can be changed without additional tools. Can be utilized for various material removal tasks on plastic, aluminum, steel, brass, and more. No motor noise helps to reduce ambient noise in the work environment. A simple mechanical design, without high-speed moving parts, makes this tool an ideal solution for collaborative processes. 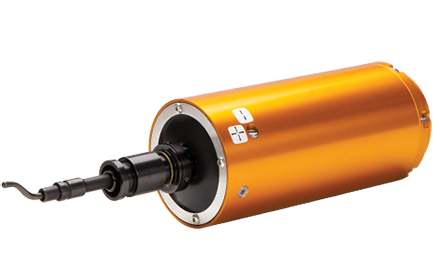 Easily switches between full radial and single-axis compliance. Floating radial and axial compliance allow fast and simple programming of the robot. The movement of the blade compensates for changes in part tolerances, part misalignment, and robot path variation.